Ventures defeat the Shrine Knights 3-1. 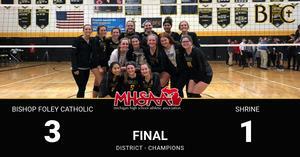 Ventures Volleyball faced off against the Knights in the District Finals on Thursday, November 1st. The Ventures started out strong as they won the first set 25-21. The team stumbled out of the blocks in set two as they were down 12-5 before storming back behind the solid serving of Kayla Moore and the big hits of Madigan Tierney. The erased the 7 point deficit and won 25-20. The Ventures appeared to be on the cusp of a title in the 3rd set with a late lead but the Knights rallied to take the set 26-24. 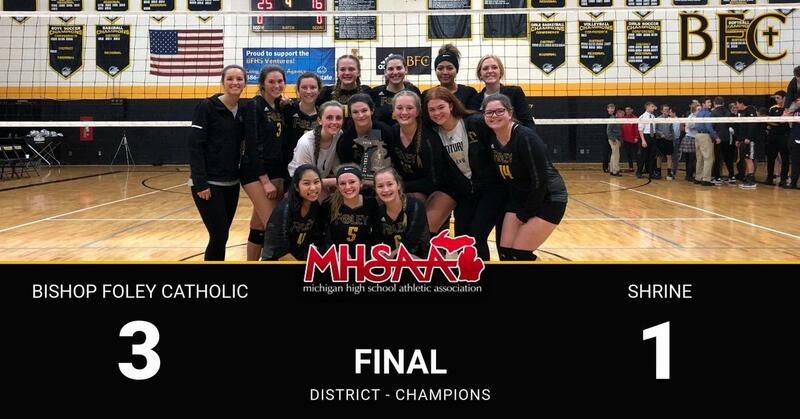 The Ventures did not let the momentum meter stay on the Knights side for long as they took an early lead in set 4 and never looked back as they won 25-16 and claimed their 3rd consecutive district championship. It was truly a team effort as many Ventures made big plays. Madigan Tierney and Kayla Moore had multiple kills. Caroline Bishop and Melanie Moore did a great job of setting up the hitters. The front line that includes Lena Campanelli, Victoria Barney, Erin Craig and Victoria Fuller had numerous blocks and kills. Anya Gulawsky and Mallory Johnson were excellent on the defensive side of the net. The team moves on to the Regionals to be held at Bishop Foley Catholic on Tuesday. The Ventures will face Brown City at 7 PM.